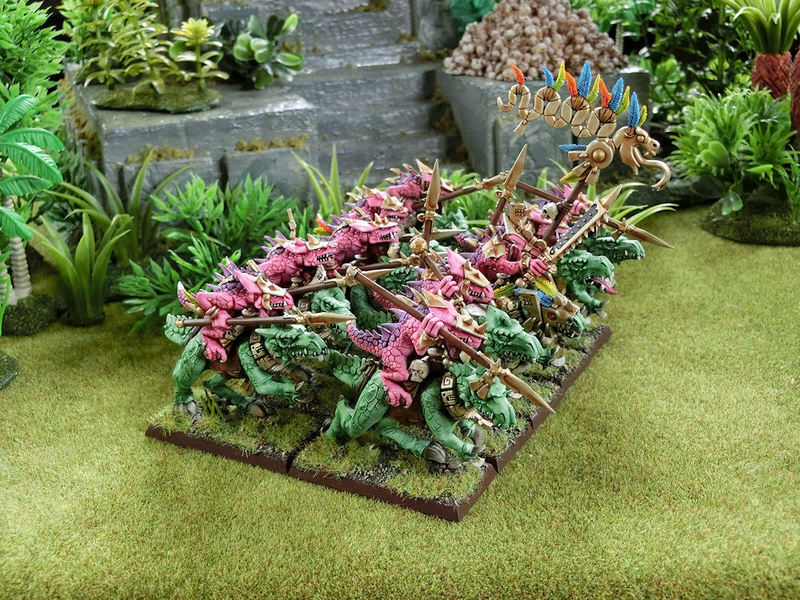 This Lizardmen army was actually started several years ago, when I needed to prepare a quick army for some demo game event. The Games Workshop washes (now called Shades) had just been released, and I wanted to see if it was possible to paint an entire army using only washes! 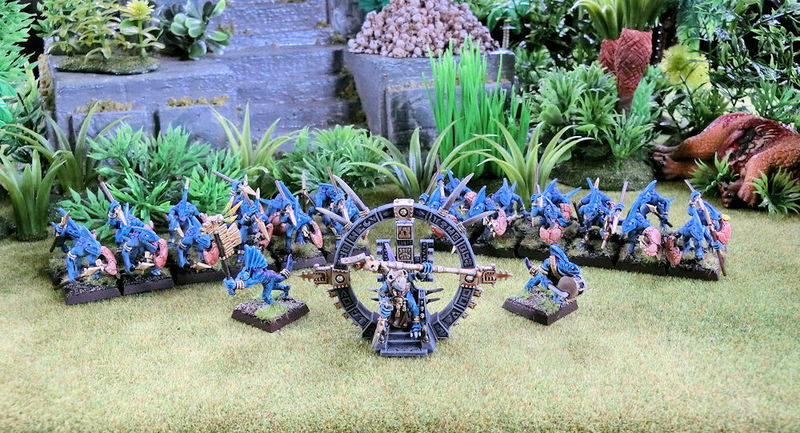 Every model was undercoated white, and given heavy washes in a variety of bright colours. Only a couple of small items on each model were painted using actual paint (leather straps and grey stone etc), but 90% of each model is wash-only! ▲ These were my test models. 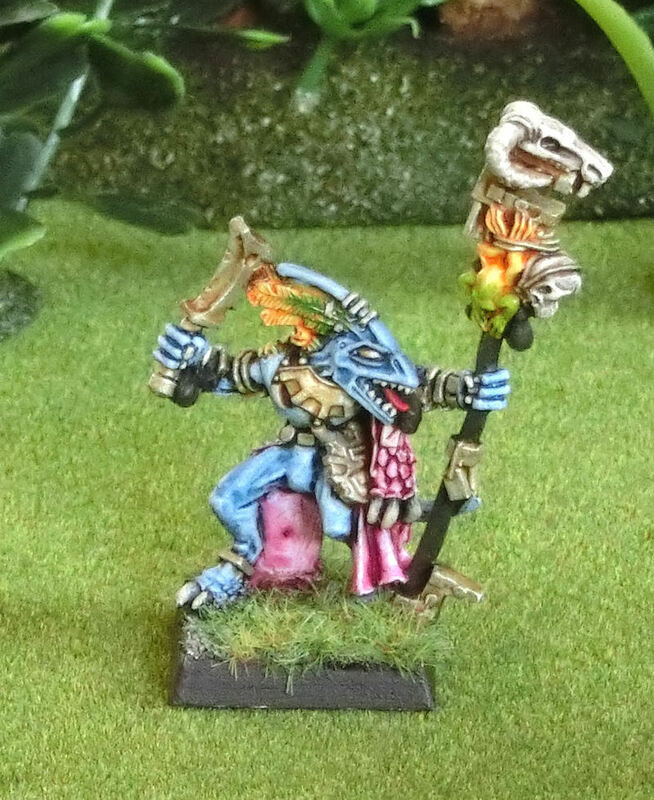 You can read about how these were produced on the Lazy Wash Painting Guide. Jump forward a few years, and I managed to pick this amazing bargain up from a gamer in Hiroshima for only 10,000 yen! Wow - that was all for 10,000 yen! Thank you, Danguinius!! 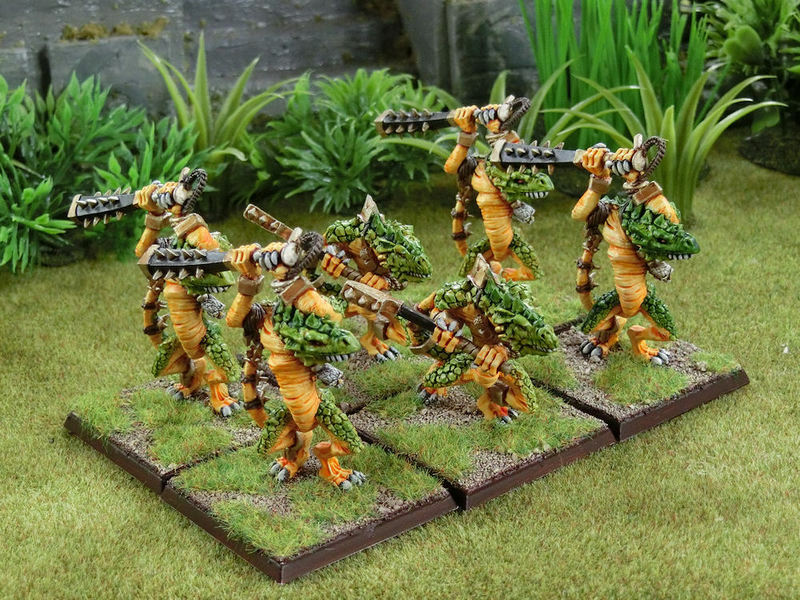 So if I add that to my existing collection of Saurus, Skink and Cold One units (1 of each), that's a fairly big army. The only thing I really need is a floaty Slann model - but of course I have to avoid finecast because it will melt upstairs in the loft! ▼ Here's my temporary army general, Chakax the Eternity Warden. Normally I would take more time and care to do a character model (compared to normal troops), but I stuck with the purple and red wash over a white undercoat, so he would match the other guys. Great model, super heavy though! He's always falling over! 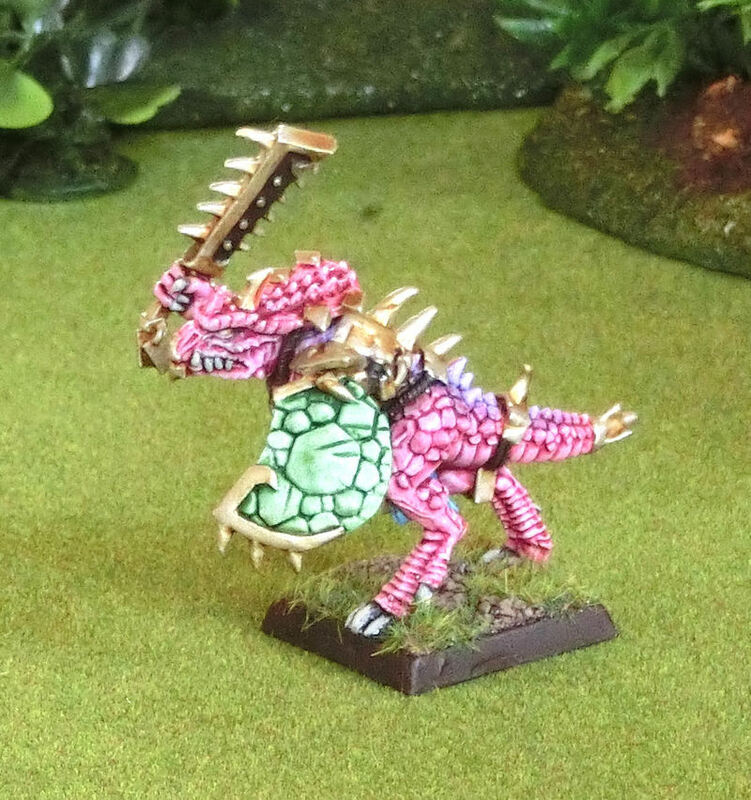 ▼ One extra Saurus warrior was left over after I made my 2 units of 25, so he got promoted. At least I had lots of extra armour plates in my bits box! I rushed through the washes on the feathers, so it looks a bit rubbish. Sorry - I had no real enthusiasm to neaten it up! 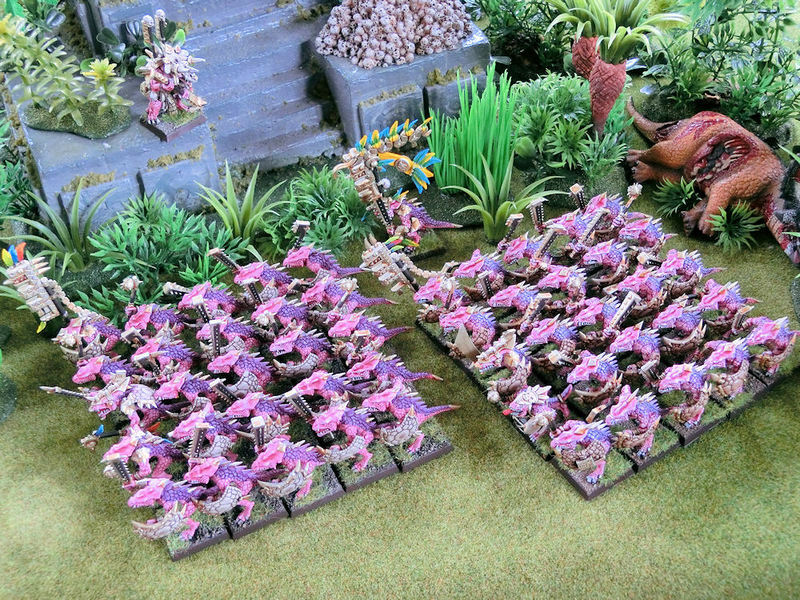 ▼ Here's what 25 wash-painted saurus warriors look like. Very bright, aren't they? 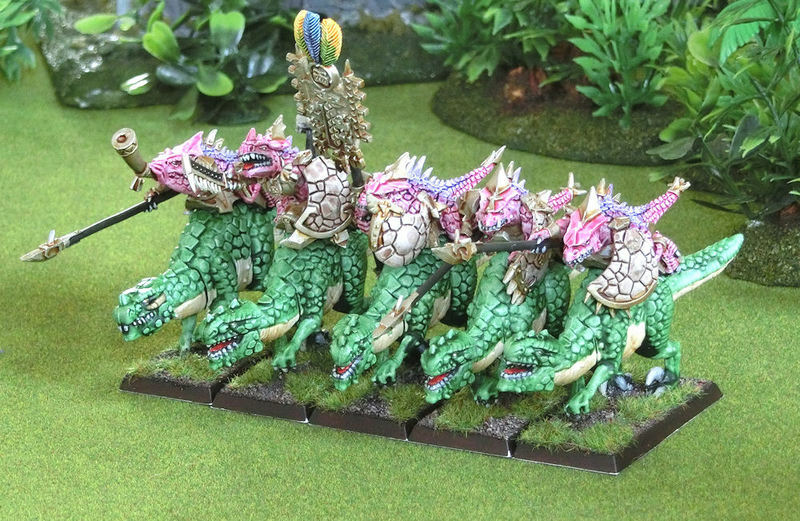 The only bits of actual paint on these models is the Charadon Granite on their weapons, and the bone coloured teeth. 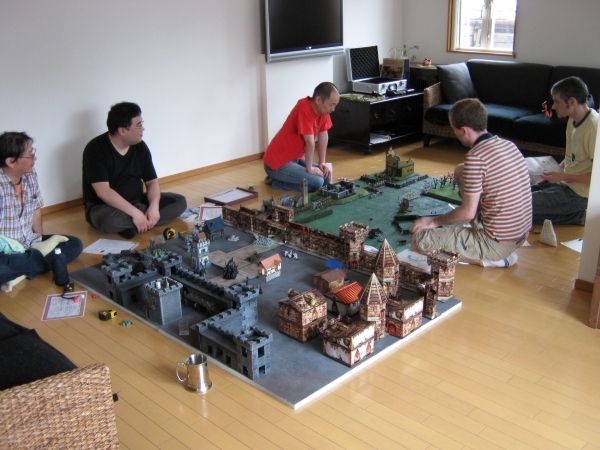 That dead stegadon model in the background, was an unwanted Reaper model that was gifted to us as terrain. It looks great tucked away in the jungle's undergrowth! ▼ All 50 saurus warriors, and their 2 heroes. That is quite a considerable block of troops to break against, with their great leadership, high toughness and good armour saves. 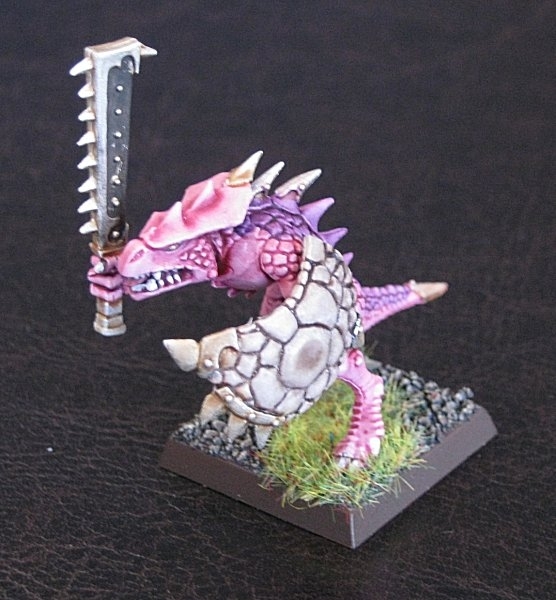 ▼ So while those two units of saurus infantry are my "anvils", this next unit is the "hammer" ... Cold One Riders! In the latest addition of the army book they gained even more attacks. 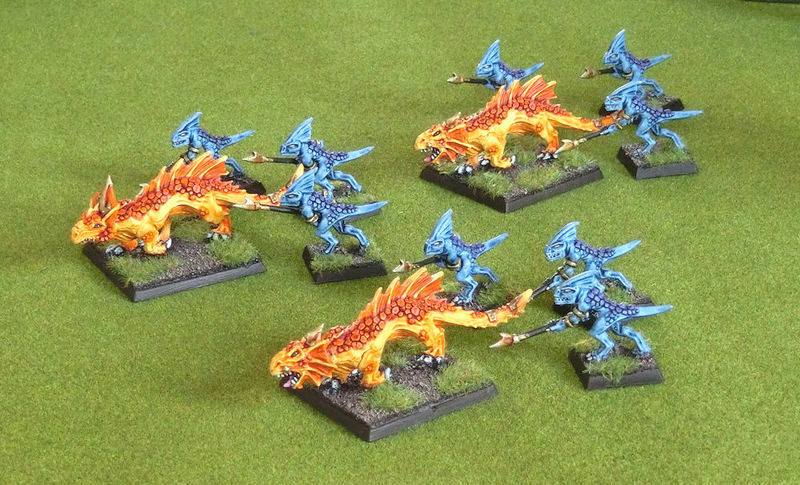 A 10-model unit is very expensive in terms of points, but these guys hit like a ton of bricks! ▼ Now for some chaff.... tons of skinks, everywhere you look! I foolishly made these to be equipped with javelins and shields, but always use them as the super-effective blowpipe skirmishers. The musician and standard bearer are new additions to the team, and are older models - with 4 fingers rather than the more recent 3. 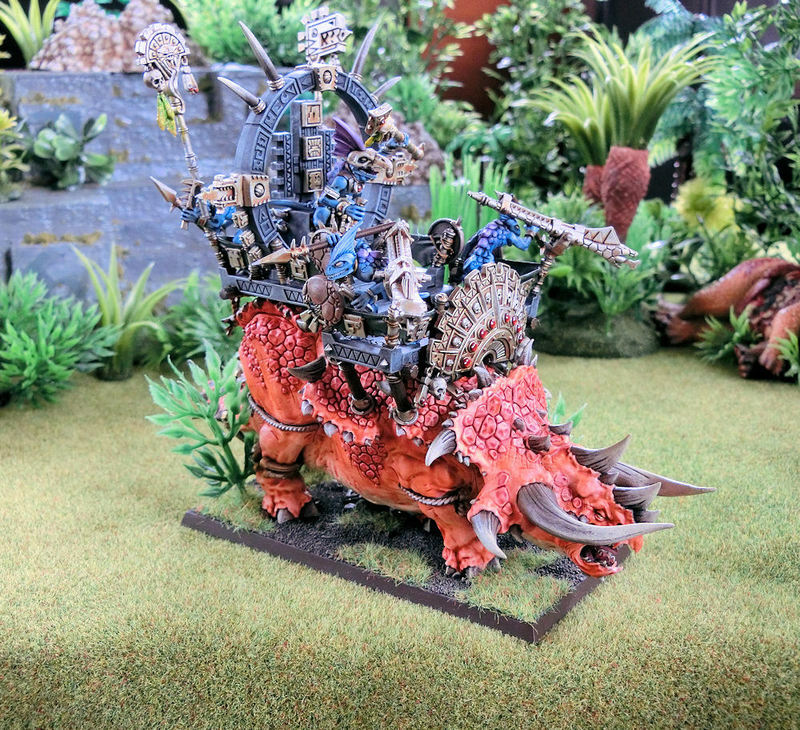 The priest in the middle is normally perched atop my Stegadon, raining comets down on his foes. 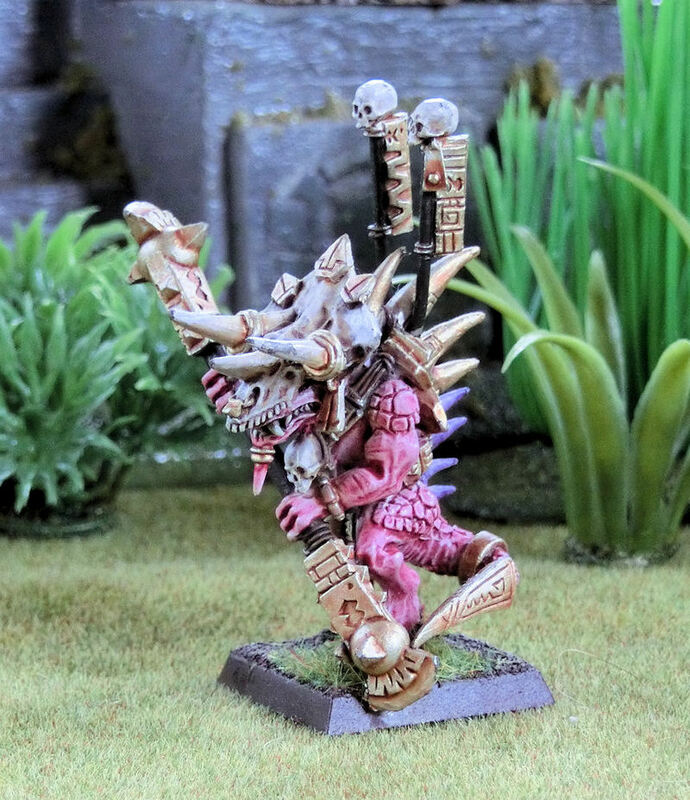 ▼ Stegadon with that rather useless mini bolt-thrower on top. The stone of the pagoda is painted with actual grey paint, but the rest of the model is all done with washes! His stomach is done with a sepia wash, then orange wash for the rest of his body, and finally a brown wash (reikland flesh, I think) on the scales. Great model to paint, and it's so suited for wash painting. ▼ Can you spot the difference? 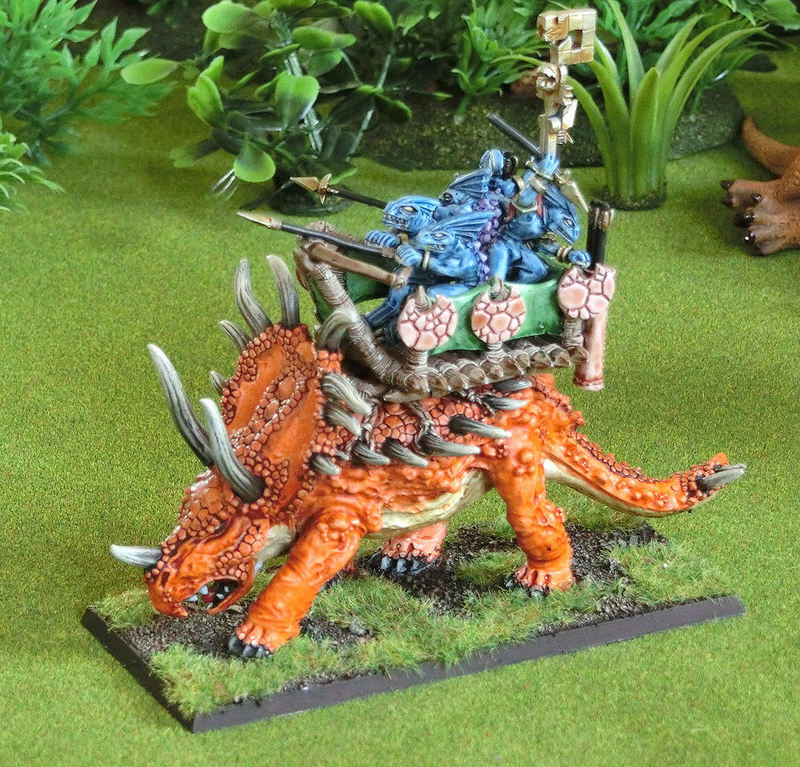 Yes, that's right - this is the Ancient Stegadon version, with the Engine of the Gods and a skink priest on top. Note the giant blowpipes on the front corners of the pagoda - I was able to drill into the corner posts and insert a small metal nail in each one, then insert a tiny (1mm) rare earth magnet in the middle of each blowpipe. That means that the blowpipes can be removed when I need to play this as a normal Stegadon. ▼ Here are some new recruits to the army - a very small squadron of Terradon Riders. These are not very powerful when used in battle, to be honest, because they are very, very easy to kill. Only toughness 3 with 2 wounds each! 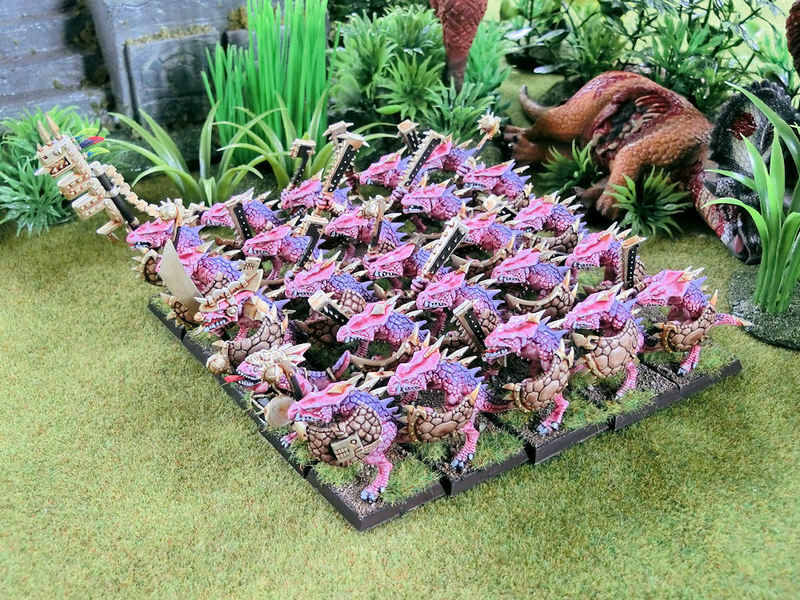 But I like their drop-rock attack, and they look great on the tabletop. 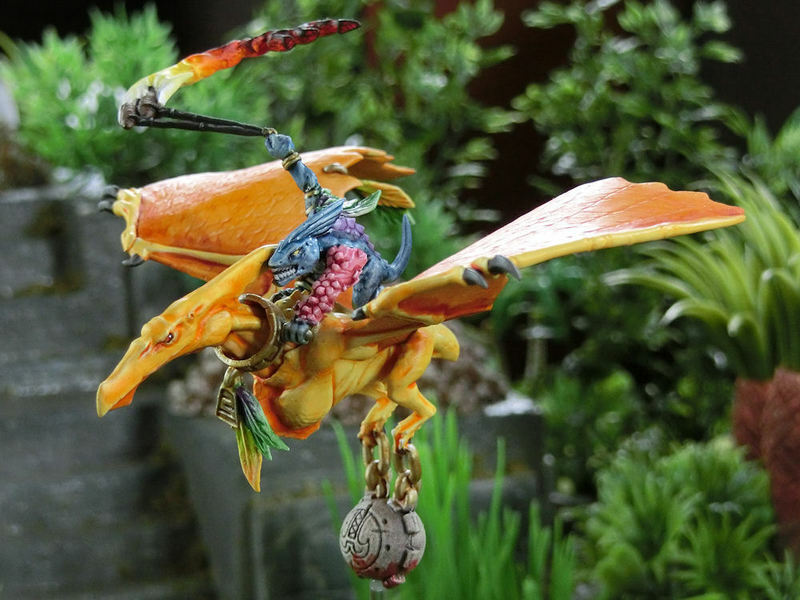 Each rider comes with bits parts to make a fire-leech bola, which is spun around their heads. This has to be the most colourful unit so far! ▼ Again, apart from the stone hanging from their claws (and a bit of smoky black), these models were entirely painted with washes. A bright yellow wash, then additional washes in orange for the wing membranes. I'm particularly happy with the way the fire colours came out. ▼ The feathers were very few on these models (thankfully! ), so I did some extra work tidying them up after the initial washes. The gradiated colours look pretty good. ▼ The third terradon rider. 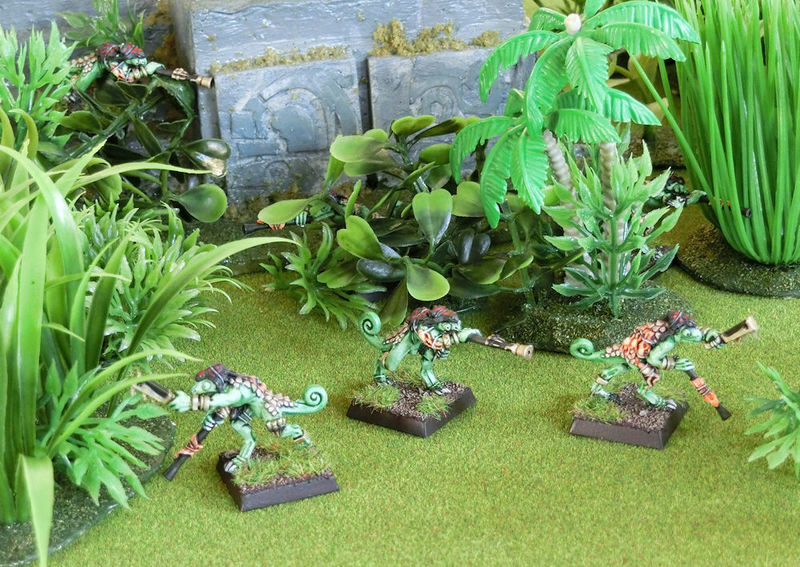 All of the models feature slightly fancy bases, with buried temple ruins and jungle undergrowth. This particular one has the best bit part in the world - a poison toad! ▼ Kroxigors - these guys are real big hitters! They are not particularly amazing, but strength 5 combined with great weapons is pretty effective against big beasties. 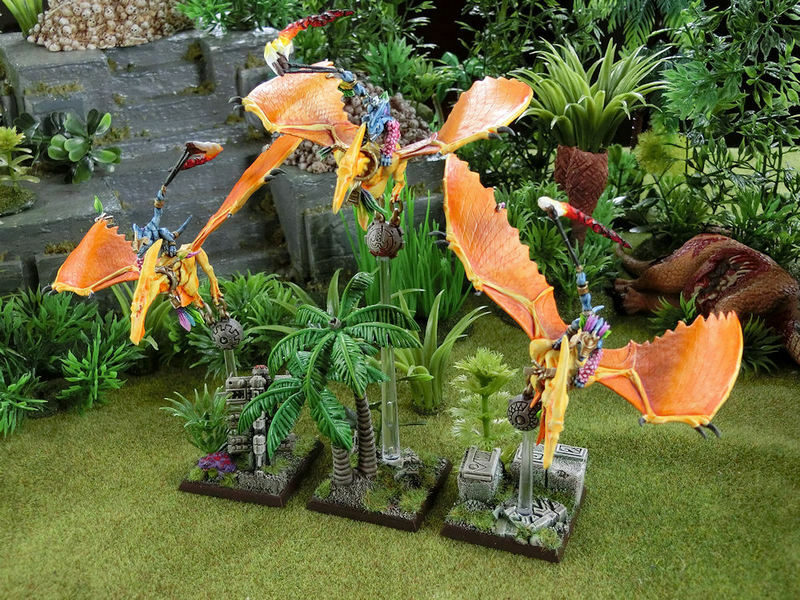 These kroxigors were washed first with yellow all over, and then green on the upper body scales, and then one more green wash down the central spines to darken it. ▼ I kicked off the second half of my mammoth wash-painting marathon with these smaller unit of Cold One Riders. These are metal riders on top of and older version of the plastic Cold Ones, affectionately referred to as "cows" by their fans. Despite the large differences between the sculpts of these and their newer siblings, they could easily be mixed together in one unit. ▼ I'd been really looking forward to having a crack at these flame-spewing fire salamanders. They are the army's version of mini-cannons, with the advantage that they can move around and still fire. I washed them in yellow all over, then orange for the scales and finally red - very fiery and eyecatching! 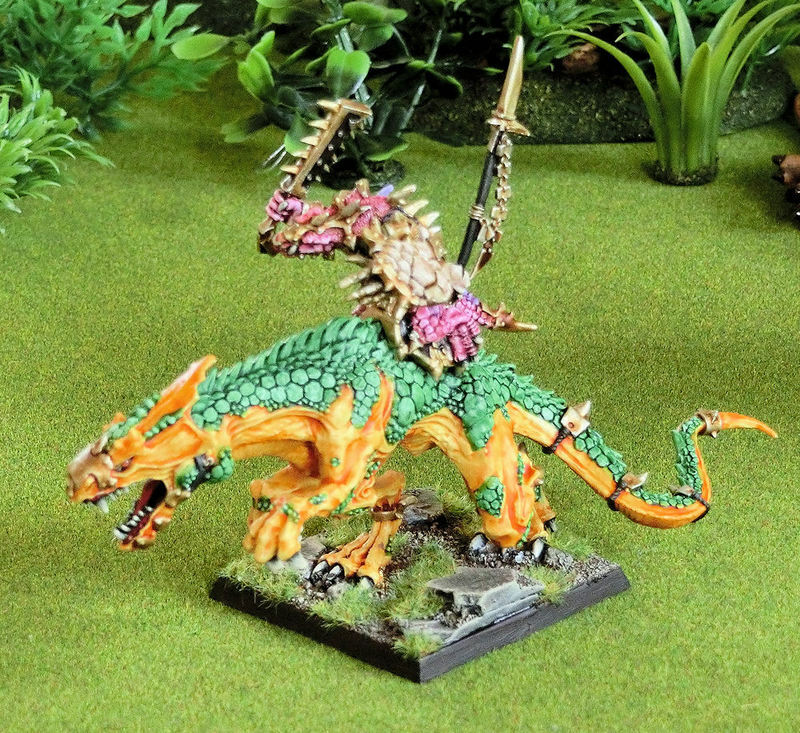 ▼ Sorry about the blurry picture of this next model, the army's general on a massive carnosaur. This is once again an older metal model, but is still a very imposing opponent to face across the battlefield. 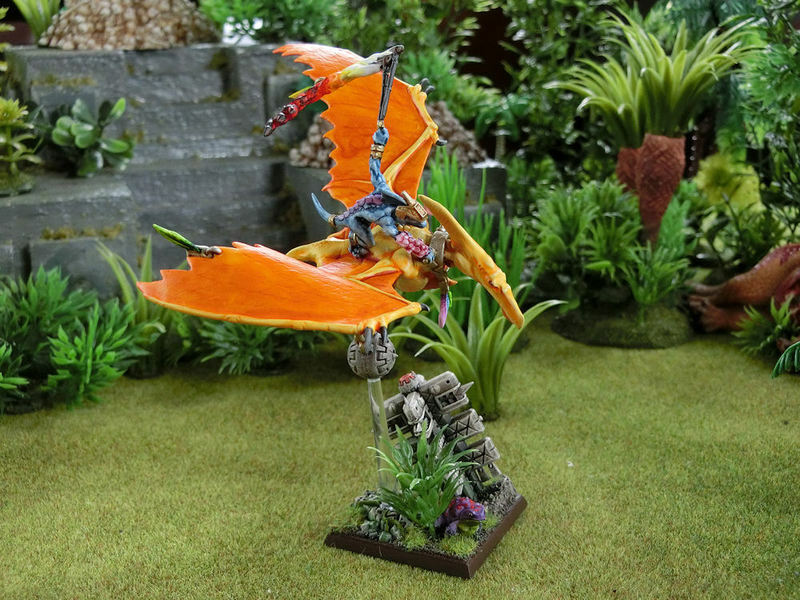 I once saw this model at a tournament (Abe-san's, I think) charge into a large block of high elves and entirely destroy them in one turn! Yikes! 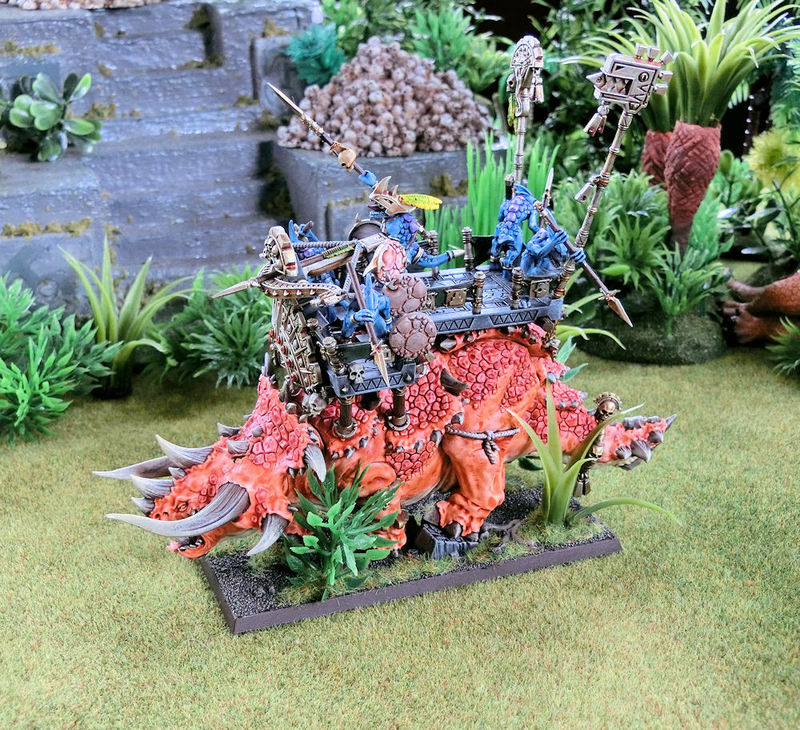 ▼ When the Saurus Oldblood lord doesn't fancy making himself such a magnet for cannonballs, he footslogs it across the battlefield with the rest of the Saurus warriors. A lord-level Saurus is surprisingly tough to beat in combat, with high strength and toughness, and a natural armour save. He is, sadly, often let down by his unit turning tail and running for the hills, however! I gave him a green-washed shield, to mark him out from the regular guys. ▼ Another metal character model - this time a lowly Skink Priest. Not quite as fancy as the more recent plastic versions with massive feathers, this model did still have a lovely amount of little details, such as the poison toad strung up on his staff. 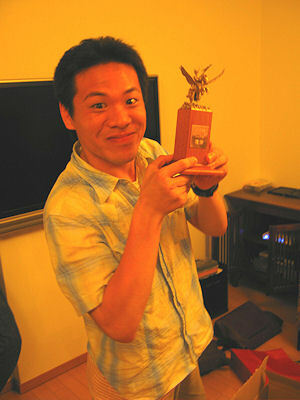 ▼ The biggest model in that 10,000 yen bundle - a metal Stegadon! Quite fiddly to put all the separate parts together, and noticeably smaller than the newer plastic version (looks like an infant next to its mother!). I washed this in shades of orange, but in a more vibrant tone than its larger relative, which will now become my Ancient Stegadon. Again, this was all done with washes only, apart from the horns. ▼ At this stage I only had 2 units left to complete, and this was the biggie! 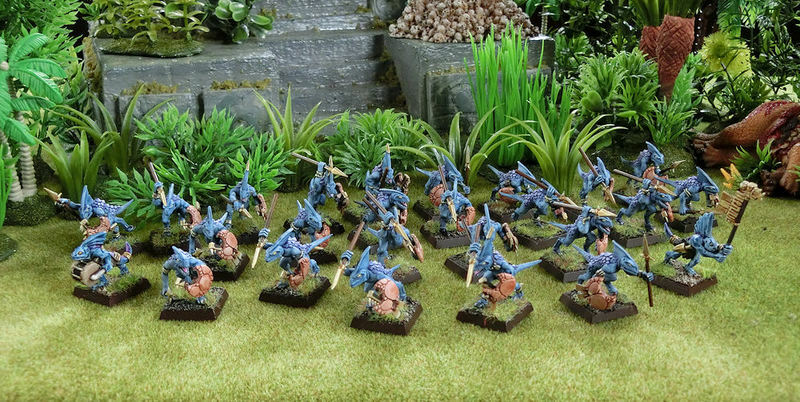 But after batch painting all 70 skink archers, this didn't seem like so much of a challenge after all! 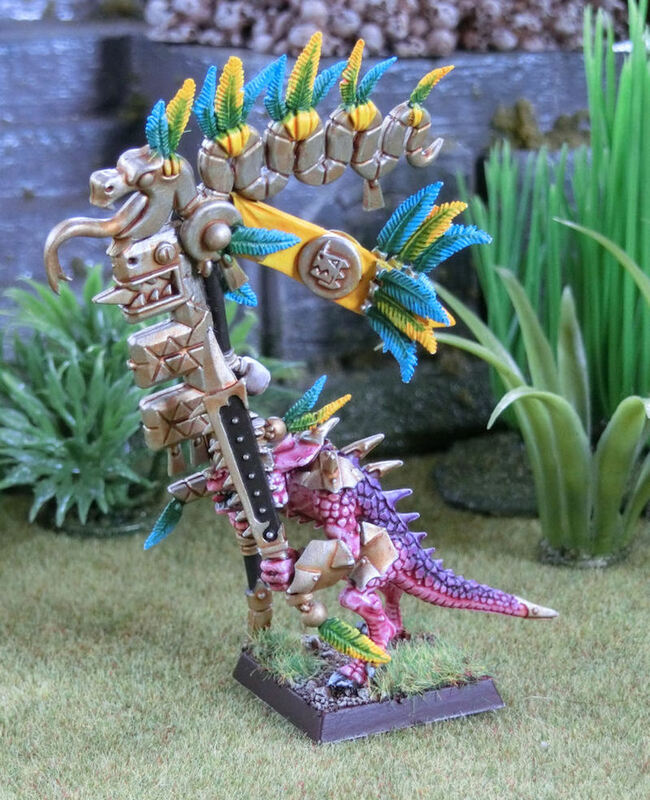 This unit is half made up of plastic Saurus warriors carrying spears, and half of old metal Temple Guard models. They look great in their skull helmets, and look quite unified as one large unit of 30. 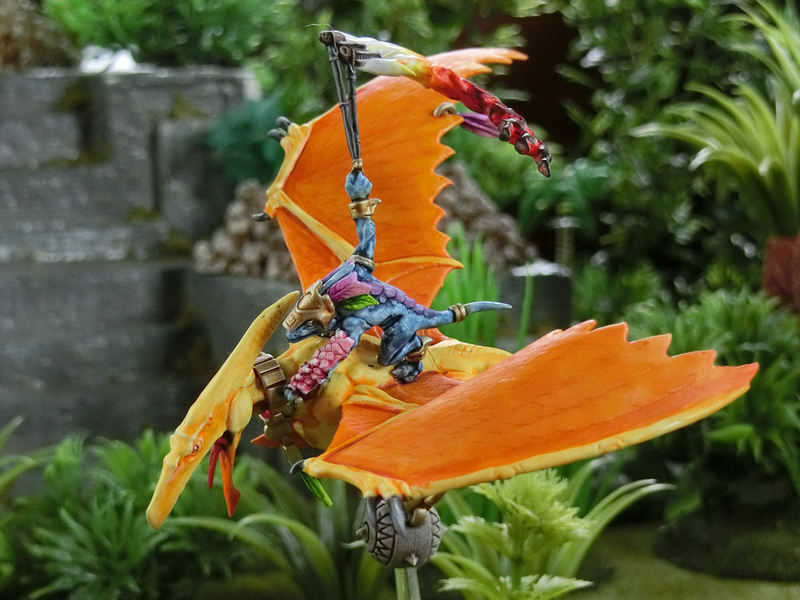 The champion and standard bearer models are very old metal models from a different unit, and would probably look very weedy alongside their more macho cousins, if their ridiculous feathers didn't distract you first! ▼ Phew! And with those Temple Guard done, only 6 models remained! Chameleon Skinks are packed with tiny details, my favourite of which are the racks of poison toads strapped to their backs and limbs. I know that just washing them in various shades of green would have made more sense for their camouflage skills, but I couldn't resist livening them up with bright orange toads, and black and red spotted skins draped over their heads. 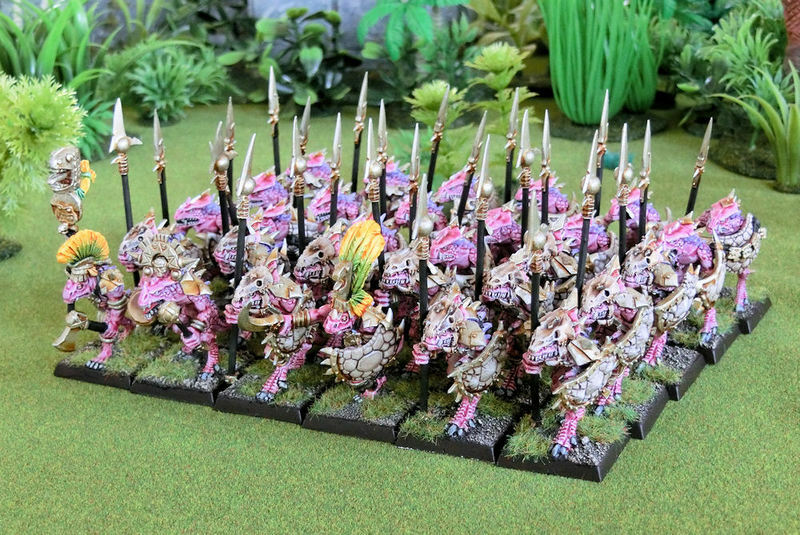 ▼ So here we have it... a photo of the entire Lizardmen Army, in all its multicoloured glory! That's nuts! What a deal! I'm looking forward to seeing them on the table. It's been a pleasure reading this, I think it has inspired me to start my own army and paint them the same way. The mottled texture on the skin looks great and quite realistic, it makes them look really leathery. Yes, try it! It's always pretty daunting starting a whole new army, but this wash painting method made them such a breeze to do. You just need a bit of faith in the end result (because the in-between stages might look pretty lame!)... Good luck!